A great italian dish! I like your version. I noticed there are several versions of this torta. I really liked Lindy’s recipe and method the best. So fantastic. That is super! I’ve got to make this! It really is a perfect pie. I love eggs so much and at first it seemed odd to use already cooked eggs inside. 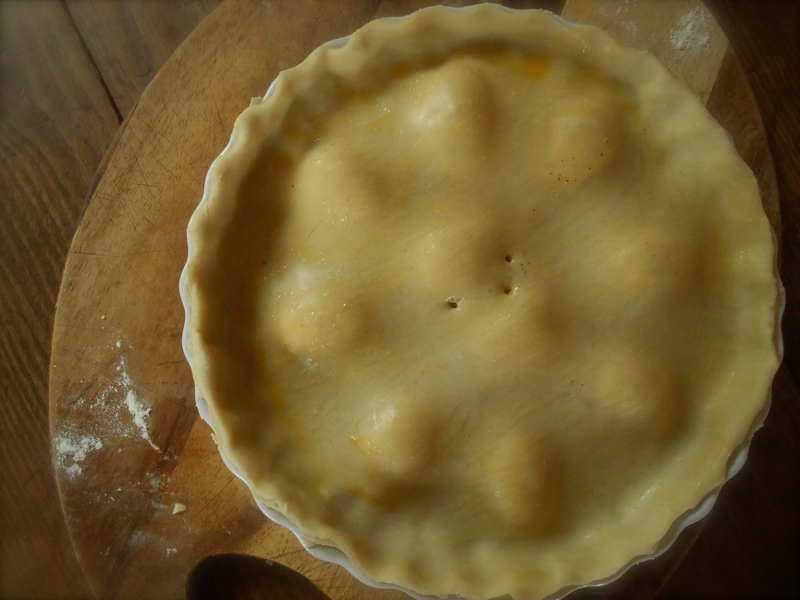 I saw a few recipes that called for the egg to be cracked into the filling and allowed to cook as the pie cooked. I was really happy making it as Lindy did. Fabulous results. I love how it looks… but I am imagining how wonderful it tasted! The hard-cooked eggs add to the presentation. Great! I added it onto my (LONG!) “to-make” list! Wow! What a great looking dish. A work of art! Looks absolutely delicious! Thank you! I love making pies. And I can’t stop…especially savory pies. There is so much you can put into them and they are always so delicious. Sweet or savory! Despite I’m italian I’ve never make the torta pasqualina, never. I’ve eaten it a lot of times, but I’ve never tried to make it by myself. But is something that in Italy we love a lot. Your version with the eggs looks really yummy! I bet it didn’t last long enough… am I wrong? beautiful photos! You are not wrong by saying it didn’t last long. I am very surprised you have not made this pie. And I am curious what versions you are used to having. I saw recipes with the egg being cracked into the filling and allowed to cook while the pie is cooking. I’m curious if the result is different. Thank you regarding the photos! Hope you make a torta pasqualina soon. Love how the halved eggs create such a great texture underneath the crust! What a great recipe. Yes! I like how it lifted the crust up and and gave it such a unique look. Make one if you get a chance. It is very pleasing! Hi Prudy! And I’m glad you tried it too! See…we do think alike don’t we. Even receiving inspiration from the same posts. :) Lindy’s recipes and post’s are very inspiring aren’t they. Both in recipe and narrative. Hope it’s warming up in your neck of the woods. We are at 80 degrees today. I feel like I took a plane to California. However, it’s headed back down in the 60’s this weekend…and rain. Have a wonderful weekend and can’t wait to see what you post next! Of course we think alike and draw our Inspiration from beautiful people such as Lindy… We are sisters!! Thank you Seana – am so touched you made this and loved it. And Prudy above too! Who knew blogging would enable us to find like-minded friends across the continent and throughout the world. Really such a beautiful connection. 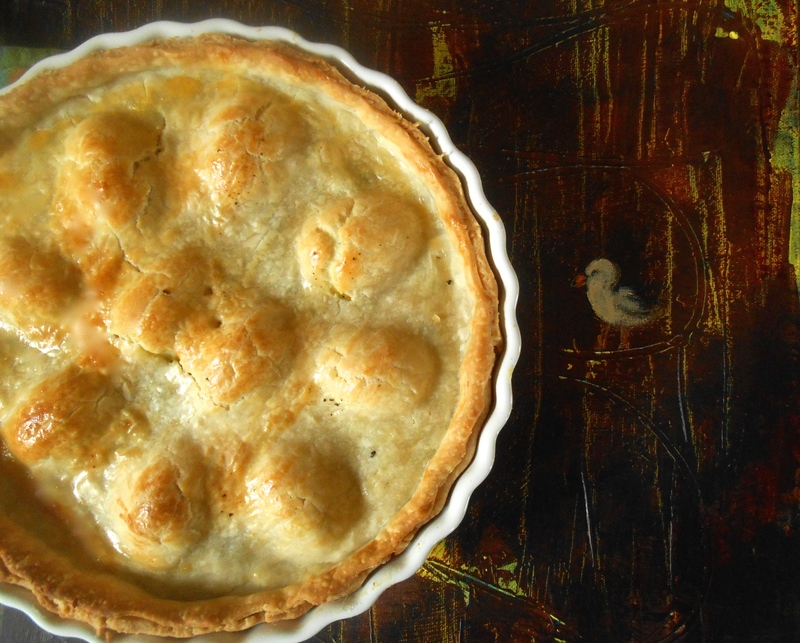 Oh yes – and the pie is gorgeous too – always love your posts and your wonderful photographs. Thank you for the shout-out. Your pie was so beautiful I just had to take pictures of it. Then it tasted so good I just had to tell everyone I know about it. I really appreciate the connections I have made across the world with blogging. My cooking has changed so much since I started this one year ago. It is like reading a new cookbook everyday, yet even better because you can actually talk with the author. It really is beautiful. Thank you for your inspiration. I need to make your no bake granola bars again! I agree completely! I feel that the French have it right. Food and the conversation about matters deeply. And I also love and value these connections. Just added ricotta and spinach to the list! I have some fresh spring onions so may substitute some of the regular onion for spring onion. This torta is gorgeous. I get inspiration from your site all the one. In fact, I am making the spring peas and mint pasta tonight for dinner! Rhubard crumble in two days! :) Will let you know how it all goes! That crust is absolutely gorgeous! And what a torta! LIdia! Hi! Where have you been? :) Nice to hear from you. Thank you. Very nice torta! I especially like that golden flaky crust :) Good work! Thanks B! I appreciate your comments. One of these days I would love to try that lentil pie you made! Every now and then I think about it. Brilliant. Award winning, right?! yep :) I can’t wait for someone to try it…would like feedback!!! It looks fab! I really must start working through all of my bookmarks!! Yes, I keep thinking I mustn’t bookmark any more but then a lovely recipe pops up….! Such a unique a beautiful dish. I love the fun egg surprise and flavorful cheese. Gorgeous, gorgeous. I too really want to make this dish. I love everything about it, I have seen 3 different posts with this recipe and each one is amazing. Your torta is wonderful. Truly looks amazing! Love the look of this!!! Great idea to use the Easter eggs that just aren’t disappearing. 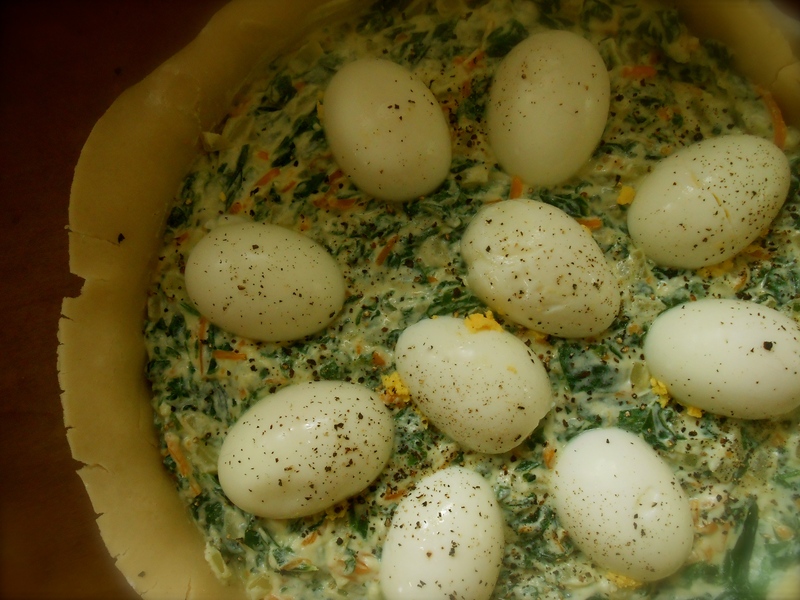 I love deviled eggs, but it is nice to just make a pie out of them. And I absolutely love Pasqualina as a girl name! Beautiful. Fingers crossed! This is beautiful. I saw Lindy’s torta and loved that as well. You did such a beautiful job. I love the way the eggs make the dish. This is so awesome Cottage! The pie or torta looks delicate and scrumptious! Very nice indeed my friend. That thing would be gone in seconds on my dinner table!! :) Oh! I made That Salad. The crunchy black rice was incredible. Please let Jennee know. Off the charts!! This looks really interesting! 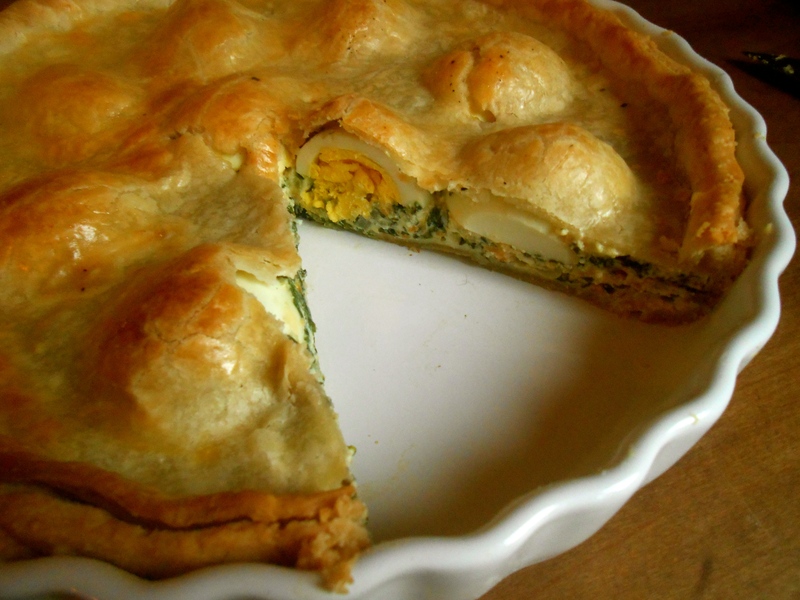 What a beautiful pie, the bumps made by the eggs made me wonder what was inside – mystery solved. Keeping this in mind for the weekend, thank you for the recipe! Yes, bumpy pie for hump(y) day, haha! Holy cow lady! This looks amazing…. I cant wait to try it, I love the idea of the whole eggs! Beautiful photos, as usual. I am thinking I will make this for a Mother’s Day brunch I am going to. What a perfect brunch dish! wow! This looks wonderful! I will bookmark it too! Hahaha! See? You most likely have a lengthy bookmark bar too. wowza–fantastic! Love how hard-cooked eggs and pot-pies–both retro in their own way–join up in your dish. You have such a way with words. I always love your comments. Oh this is wonderful, your crust is absolutely gorgeous and the inside is beautiful with the hard boiled eggs. Bookmarked, Seana. I cannot wait to try this!! This looks fabulous Seana… love how it looks when you cut into it! So so pretty! This reminds me of our years in Spain and some bakeries would bake eggs into the loaves of bread– It’s a lovely dish Seana! This was not a part of my family’s cooking tradition but I am familiar with it. Your torta looks authentic, right down to the serving suggestion that it can be served at room temperature. I bet it was delicious! You are currently reading torta pasqualina at COTTAGE GROVE HOUSE.